21 Jul Why Do I Need A Custom Closet? As you can imagine, most homes nowadays are getting smaller with less storage space available and we seem to become pack rats over the years. The result of being a pack rat is that you need somewhere to store all of your items. Whether they are collectibles, laundry needs or your extensive wardrobe, you need an efficient method of storing these. What you should really consider is what kind of a designer do you want to consider. Experience is absolutely necessary but keep in mind, with an in-home consultation, don’t expect to get drawings and plans for free. As with hiring any professional, drawings and plans are not done in five seconds and if they are given out free, then the designer doesn’t put any value on his work. If you were hiring an architect, he would expect a deposit or at least a payment for his plans. Therefore, expect to pay for experience. A plumber, for example, charges you for simply going to your home before he has done any work and you have no idea what his skill level is before his arrival. Another reason why you need a custom storage is to use what space in your home you have to his utmost maximum. Off the rack storage is fine if you have ample space, but custom work uses every inch whether it vertical or horizontal. 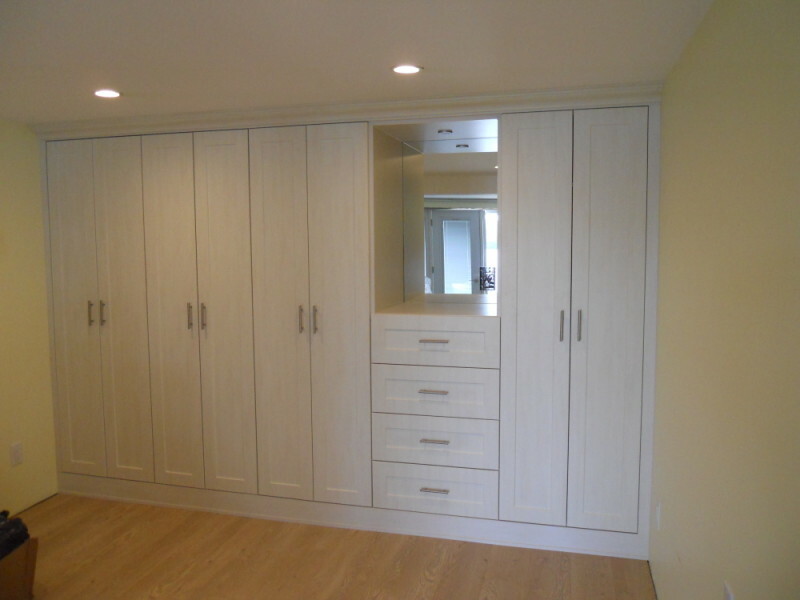 Keep in mind a customer should have some questions before hiring a closet manufacturer. Warranties are very important. I know we offer a lifetime warranty under normal use which basically means that the product has a lifetime warranty if used how it should be. Another question is where does your materials come from? 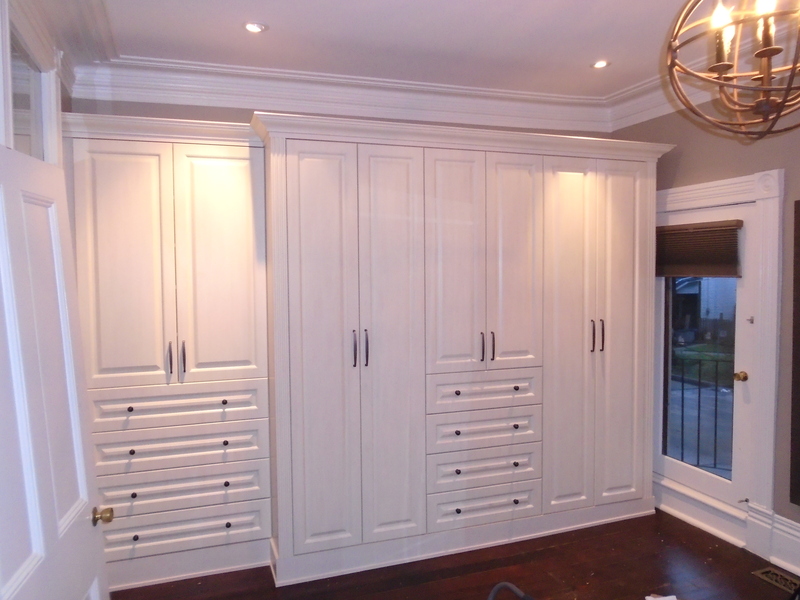 We use for example 100% Canadian material for most of our closets and other projects. We find with locally made material, we don’t have the issue of off-gasing like foreign imports have and we can offer a higher gram-weight. Are you dealing with a franchise or directly with the owner? I find with a non-franchise store you usually get a better deal since you’re not up against rigid pricing as opposed to working with the owner of the shop with a non-franchise. In regards to closets, always good to find out what materials besides the wood goes into their construction. A 1 1/4” round closet rod is the best way to go since they grab your hangers better and offer a greater rigidity and strength. Oval rods however nice they may look don’t offer the strength that a round rod can. Glides on drawers are also another consideration. Glides can be as little as a couple of bucks for one or as much as $20 or more. Ask your designer what kind are going to be used since they help extend the longevity of your closet drawers. For shelves, I have often seen cheap plastic holders used to hold the shelves in place. This should be avoided as much as possible since metal pinning is far superior and rarely break down or become brittle like the plastic variety does. Design-wise, a custom closet offers unique features just not possible with an off the rack storage system. Pull-out shoe racks can be created to accommodate not only high heels and loafers but perhaps your favourite riding or hunting boots. Custom closets can also adjust to your needs by perhaps having an adjustable closet rod to work with the growing height of children. One customer we had received his shirts from the cleaners and were a specific size and we created drawers to house the size of these shirts so they could be stored most efficiently. Do you have a lot of jewelry, costume or the real thing? 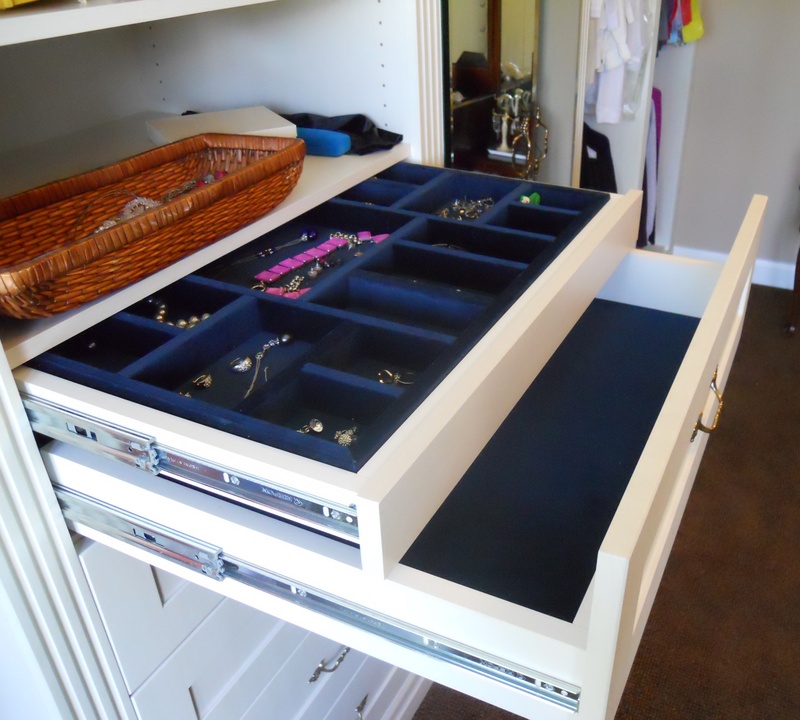 We can create custom jewelry drawers to fit them perfectly. After all, most jewelry is not inexpensive and needs to be cared for.